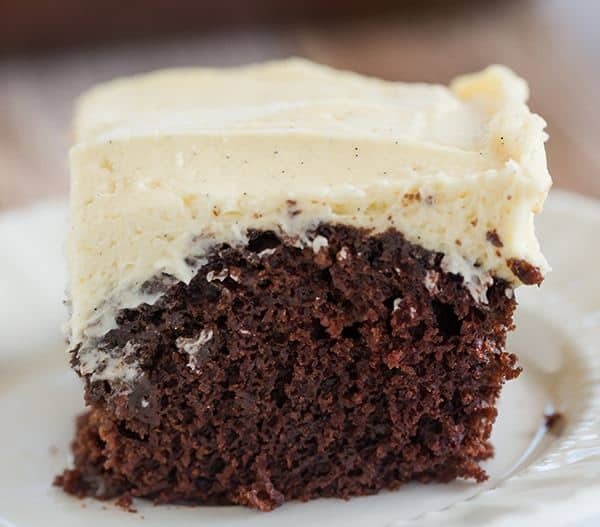 Chocolate cake with a simple vanilla frosting – this “wacky cake” recipe, which uses no butter, eggs or milk, was popular during WWII when rationing was prevalent. 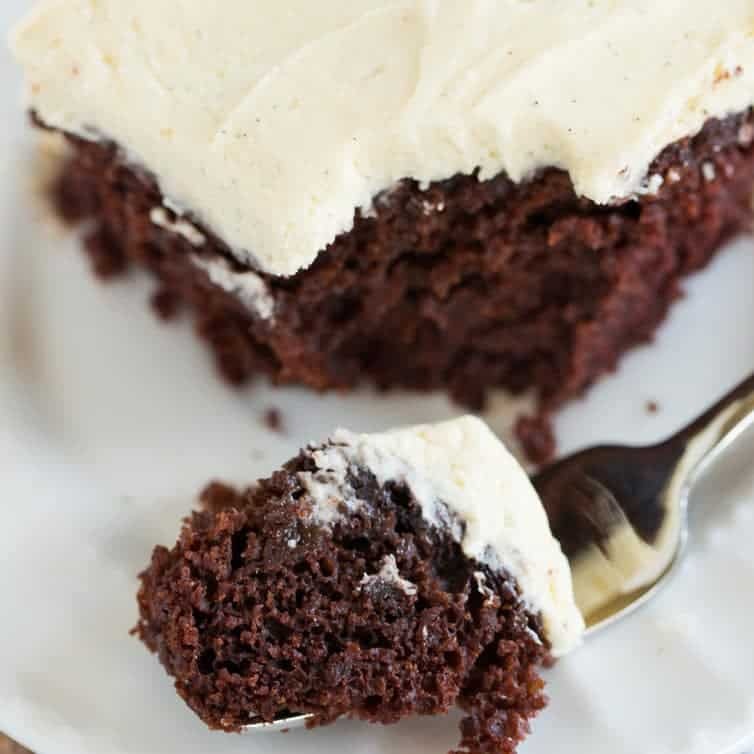 Last month, I made Chocolate Dump-It Cake, which is a one-pot cake recipe dating back to the 1930’s or 1940’s, and it has quickly become one of the most popular recipes I’ve shared recently. 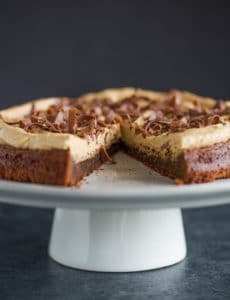 A reader left a comment on that post about “wacky cake”, and another reader, Nancy, emailed me her family’s recipe for this one-pan, light-as-air chocolate cake. 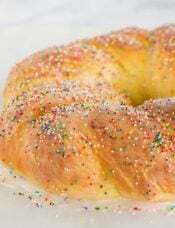 The premise of the cake – the reason it’s “wacky” – is that there is no butter, no eggs and no milk in the cake. Everything is mixed together right in the pan, using only a fork. 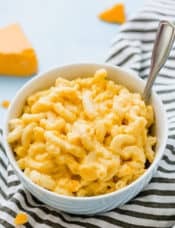 After doing some reading, I found that this was a popular recipe during World War II because of the rationing of those ingredients. Those ladies knew what they were doing, because this is a phenomenal cake! My family couldn’t believe the cake lacked all of those typical cake ingredients, and happily devoured it, commenting over and over about how delicious it was. 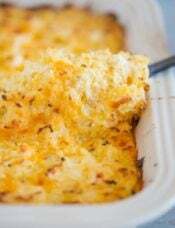 This cake really could not be any easier to throw together – grab your favorite 8-inch square baking dish, put all of the dry ingredients in there and mix together with a fork. 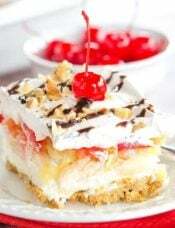 Then, make three wells and add the vinegar, vanilla extract and oil into each… Pour water over the entire mixture and stir with a fork until well combined. Voila! Ready for the oven! Nancy’s recipe said to top the cooled cake with your favorite vanilla frosting, so I did just that. It’s my standard vanilla that I use for any vanilla-topped cupcakes (like the homemade funfetti cupcakes); I was running low on vanilla extract, so I used vanilla bean paste in its place, and oh my! The flavor and all of those little bean specks – loved it! The reviews were unanimous among my family – everyone loved the cake. 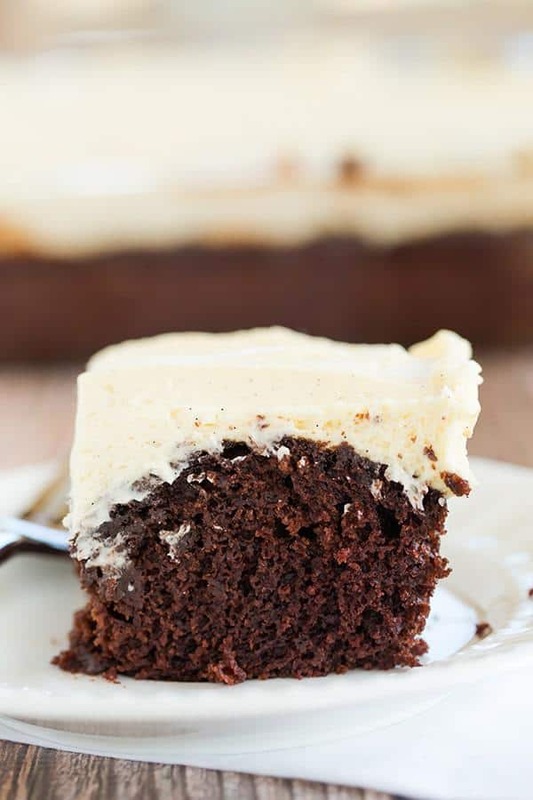 It turned out wonderfully light, moist and full of chocolate flavor; the vanilla frosting was a great contrast and a big hit. 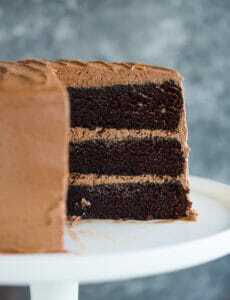 This recipe deserves to be in everyone’s recipe box – it’s so easy, super quick, and makes a wonderfully delicious chocolate cake suitable for any dessert occasion! 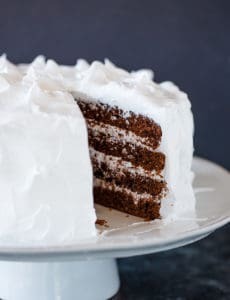 A chocolate cake with vanilla frosting - the recipe, which uses no butter, eggs or milk, was popular during WWII when rationing was prevalent. 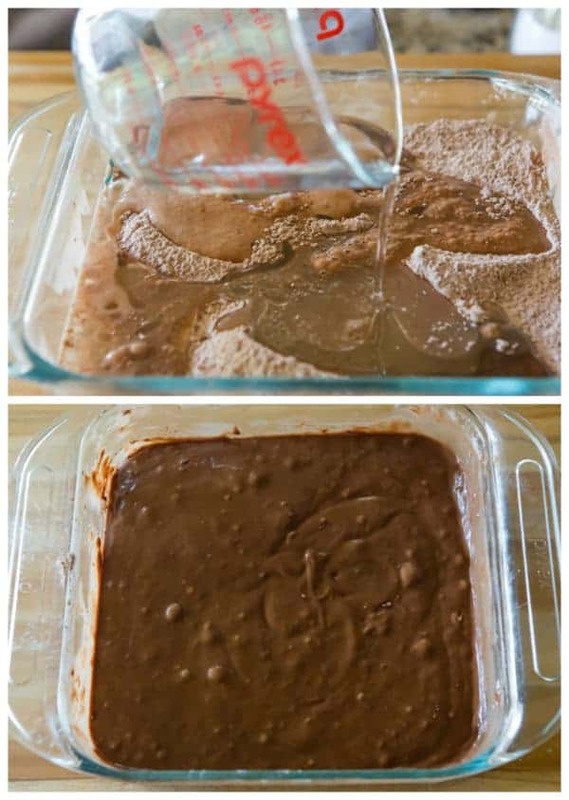 In an ungreased glass or ceramic 8-inch square pan (do not use metal), add the flour, sugar, cocoa powder, baking soda and salt, and stir to combine with a fork. 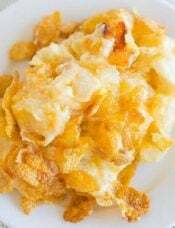 Make three wells in the mixture and to those wells add the vinegar, vanilla extract and vegetable oil. 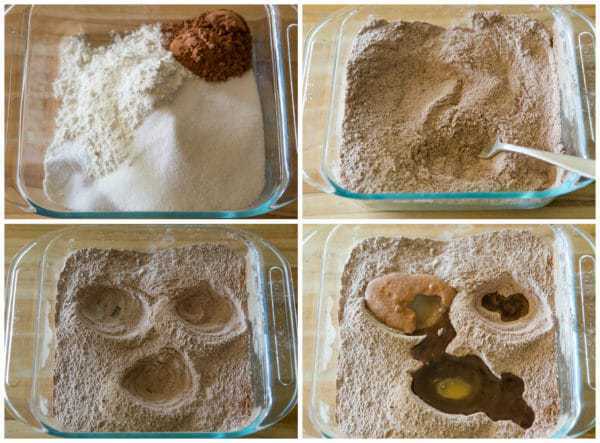 Pour the water over the entire mixture and mix with a fork until thoroughly combined and no dry ingredients remain. Bake until a toothpick inserted in the center comes out clean, 26 to 30 minutes. Place the pan on a wire rack to cool completely before frosting. 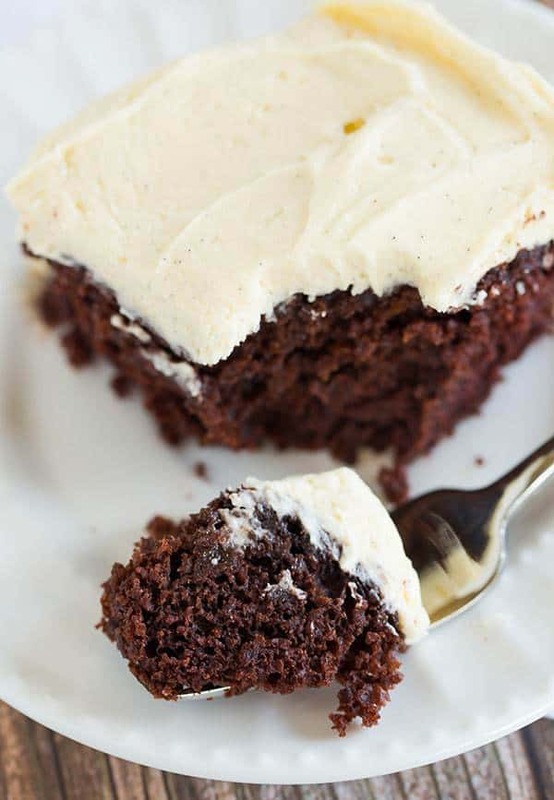 Using a spatula, spread the vanilla frosting evenly over the top of the cake. The cake can be stored, covered with plastic wrap, at room temperature, for up to 4 days. 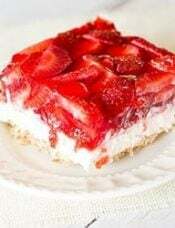 This cake was so easy, so yummy, and I had everything in my pantry (which is why I chose it)! Perfect!